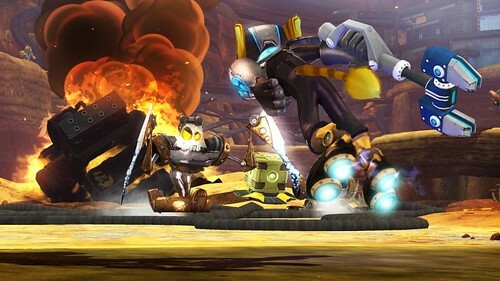 The Dynamic duo of Ratchet and Clank return for an eight time together, and are once again tasked with Saving the Universe from the forces of Dr. Naferious. Join the fun and travel across the galaxy on a joy ride full of mayhem and the usual comedic delight you have come to expect from Insomniac games. For those of you familiar with the Ratchet and Clank series will find this to be a fun and familiar experience, but for those new to the series I recommend you go back and play the first two titles in the Future series to get a better understanding of the characters and story (Ratchet & Clank Future: Tools of Destruction released 2007 and Ratchet & Clank Future: Quest for Booty released 2008). Nothing like picking up a trilogy on book three and they can both be found for less than 30$ CDN. Jumping right in… A Crack in Time delivered the same expected enjoyment and game play you have come to expect from this series, but did not really WOW me… game play is basically the same from every previous version with new locations and a new story line. I just didn’t really see any major improvements with the core functionality of the game. There were some improvements with the weapon systems offering the ability to customize a number of features on a new line of Constructo weapons and Ratchet’s space ship. Offering upgrades to things like the Ammunition and colour of your weapons and ultimately upgrading to a Mega Constructo weapon. Upgrades don’t stop there, collecting Golden Bolts and rescuing lost and trapped Zoni will provide many helpful and interesting tools to assist on your journey. Where Insomniac delivered was with the story line. Offering two separate adventures, one for each of our heroes, as well as the ability influence the future by travelling back in time to make significant changes that help you in the future. Find out about Clank’s story and the reason he was built and the source of his special skills and abilities… All this while Ratchet is racing across the galaxy looking for the clues to find his lost friend and finding a few new ones along the way. Both Ratchet and Clank will learn the history behind their apparent orphanings. During your travels you will stumble upon the usual battle arena area similar to those found in previous R&C games. Remember that the Arean brings along a number of valuable weapon upgrades, game rewards and bolts (lots and lots of bolts). You’ll also find many of the popular characters from past R&C games; Quark, the Plumber and the intergalactic Smuggler all offering their unique and helpful advice and oddities. A classic game series that has a place in any PlayStation library. Not a lot of difference from the previous R&C Games in terms of core game play.